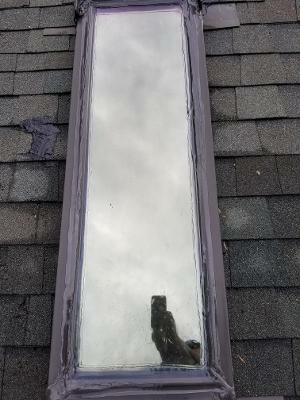 The most common area we see on a older skylight that leaks is usually the bottom corner. This usually happens where the metal frame meets the glass in the bottom corner. As your skylight ages the seal gives out and the metal pulls apart. When this happens as the water runs down the pitch of your glass to the bottom it finds this crack and leaks inside. Now if you have a newer roof and new skylight and it leaks most of the time what we see then is the roofer did not install the flashing properly. Most skylights made these days have flashing kits that need to be installed correctly. Another good measure we like to do is install a Ice&Water barrier around the light before installing the flashings. This is a good secondary protection against leaks that may penetrate the flashing. Like hard wind drivin rain or ice dams backing up underneath shingles. If you have condensation in the winter time around the glass or frame a good thing to check is if the skylight shaft has been properly insulated in the attic space. The shaft is what connects the skylight to the ceiling below. 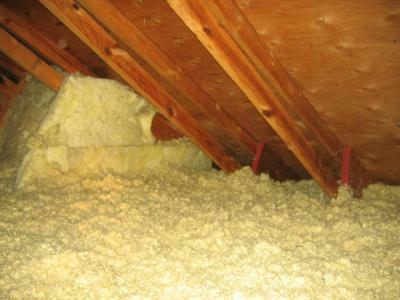 Skylight shaft walls are usually sloped with the pitch of your roof and it’s essential that they be well insulated. You probably have a warranty on your roof against leaks but when the contractor comes out he is gonna tell you that you reused the old light and that’s what’s leaking and not the contractors fault. You will more then likely have a mismatched shingle look when they replace the skylight. Shingles around the skylight will have to be replaced when reflashing. So now you will have a not so aesthetically pleasing roof to look at. Sometimes these days the way shingle manufactures are making the sealant strips on shingles you can’t get them apart. So it’s impossible sometimes to get shingles apart to do simple repairs. And if you can’t get them apart without tearing them you end up replacing that complete section of roofing. So yes we see it all the time when people get new roofs and don’t replace a skylight and 5 years later it leaks. They think they are covered with a roof warranty only to find out then that they reused the old skylight and have no warranty. And the contractor will charge you a huge bill to then replace the skylight. So on top of all this headache this is why you replace the skylight at the same time you do the roofing period! We have certain things we can do if you have leaks on the skylight and are not quite ready for complete roof replacement that costs many of thousands of $$. As we specialize in roof repair only. We can use a clear sealant and apply it where the glass meets the metal on the edges. Yes you will see the clear sealant a bit if you look up through the glass from your home. The other thing we can do if we think it’s a flashing problem is apply a rubberized roof sealant around the light where the shingles meet. This is a black color and yes you will see it when looking up at the roof from outside. So yes they look like roof repairs but that’s what they are.